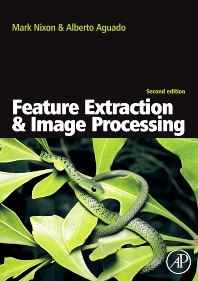 Whilst other books cover a broad range of topics, Feature Extraction and Image Processing takes one of the prime targets of applied computer vision, feature extraction, and uses it to provide an essential guide to the implementation of image processing and computer vision techniques. Acting as both a source of reference and a student text, the book explains techniques and fundamentals in a clear and concise manner and helps readers to develop working techniques, with usable code provided throughout. The new edition is updated throughout in line with developments in the field, and is revised to focus on mathematical programming in Matlab. Mark Nixon is the Professor in Computer Vision at the University of Southampton UK. His research interests are in image processing and computer vision. His team develops new techniques for static and moving shape extraction which have found application in biometrics and in medical image analysis. His team were early workers in automatic face recognition, later came to pioneer gait recognition and more recently joined the pioneers of ear biometrics. With Tieniu Tan and Rama Chellappa, their book Human ID based on Gait is part of the Springer Series on Biometrics and was published in 2005. He has chaired/ program chaired many conferences (BMVC 98, AVBPA 03, IEEE Face and Gesture FG06, ICPR 04, ICB 09, IEEE BTAS 2010) and given many invited talks. Dr. Nixon is a Fellow IET and a Fellow IAPR.